Version 2.0 of CREA will incorporate several technical advances and multiple implementations to build a next generation social network. In this post we will focus on explaining the operation of the new digital assets: CREA ENERGY (CGY) and CREA DOLLAR (CBD). CREA is the main currency of the blockchain of Crea. The rest of the tokens will get their value from this main asset. CREA is a liquid currency, so you can trade with it in exchanges, send it to other users or directly use it as a payment method. How to get CREA now in version 1.0? You can currently get CREA in some exchanges or through the Mining process. How to get CREA in version 2.0? Through an exchange of cryptocurrencies, creating quality content in the social network and obtaining rewards, or exchanging CGY and CBD by CREA through different methods integrated in the platform. You can also become a witness and you will receive rewards for being a network validation node. (15% of annual inflation). In the cryptocurrency sector, most speculators jump from one cryptocurrency to another based only on which one is expected to have a short-term growth, without caring too much about the objectives that they promote or the developments of the project behind. Crea wants to build a community mostly controlled by people with a long-term vision and interest on the platform. For this, users can convert their CREA to Crea Energy (CGY). This asset can not be transferred to other users and could hardly be used in cryptocurrency exchanges, however it offers many benefits within the platform. This commitment to the network entails a return process of the committed CREA of 8 weeks through a weekly payment. CGY is the creative energy and an indicator of the power of each user when voting for content or network witnesses (DPOS). When users vote for publications, their influence on the distribution of rewards is directly proportional to the amount of CGY they have. This means that CGY is a token that grants its holders exclusive powers within the Crea platform. In addition, CGY holders will receive 15% of annual inflation as a reward. The number of new CGY tokens that they receive is directly proportional to the amount of CGY they keep in relation to the total amount of CGY granted to the total of users. This is a system similar to the POS of other cryptocurrencies, with the difference that CGY assets can continue to be used since they are not blocked. How can you get CGY? 1- Through the publication of content on the network. 2- Converting your CREA to Crea Energy directly from the wallet. An important handicap in the cryptocurrency sector in general is the volatility or instability in the exchange prices of its digital assets. This feature can put at risk the value of the work of a user or creative that uses the social network to distribute or buy content. Stability is essential in any kind of successful economy. 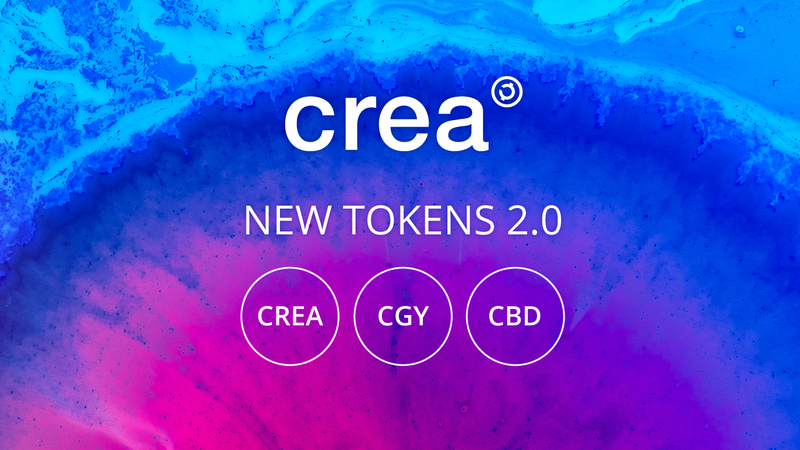 In order for users to obtain this stability, Crea 2.0 will incorporate a new asset type called Crea Dollar (CBD). The CBD or “CREA Based Dollar” is intended to have a price correlation with the US Dollar. CBD may be withdrawn at any time by users. The CREA Core takes and destroys the CBD and then creates a new CREA. The conversion ratio is calculated using the market price. If the CREA value is 10 cents, a Crea Dollar could be exchanged for 10 CREA. This is why its price always tries to stay stable and close to the value of 1 USD. Apart from being pegged asset, it can also be used inside the platform, for example to buy promoted spaces. How can you get CBD? CBD can be converted to CREA in two ways. Using the internal exchange of the social network where you can only exchange between CREA and CBD, although the price in this market could vary due to speculation. These are the main details of the characteristics and functioning of CREA tokens in the new version that will be released soon. Here you can find other implementations of Crea 2.0. In the next post we will talk about how the reward of the network will be issued and in what percentages the reward will be distributed to authors, curators, holders and DPoS nodes.